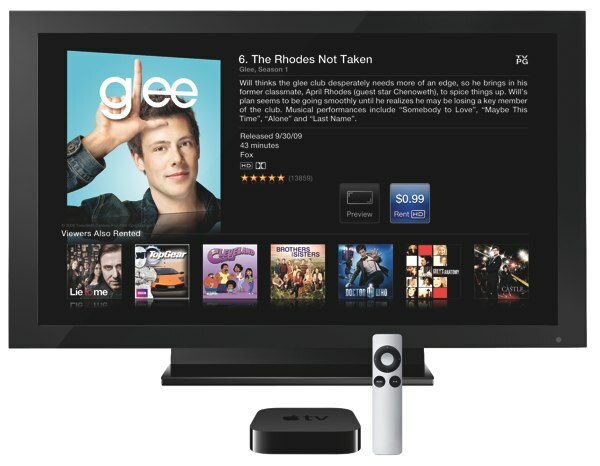 Apple TV Comes Back in Black for $99! Steve Jobs does the famous "One more Thing" with the long overdue update to the Apple TV. There were rumours that the new Apple TV would look just like an iPhone except without a screen, but as it turns out it is a fourth of the size of the original and it is black, black plastic. Which is most likely one of the reasons why Apple lowered the cost. Apple's A4 processor now powers the new Apple TV for effortless streaming without any stutters or freezes. This update is a drastic change from the previous model, as no content is stored on the device, all of it is downloaded straight from iTunes as rentals. On the back of the new Apple TV, there are inputs for one HDMI cable, power cable (no more power brick as the power supply is now built in), optical audio and ethernet. You can control the Apple TV by the supplied aluminum remote or by the Apple Remote app using your iPhone, iPad or iPod Touch via AirPlay. You can get all the fine details here. To give you an idea of how small this box really is, you can fit it on the palm of your hand.